I haven't written a blog post in more than four months! Yes, just like everyone else in this day and age, I've been crazy busy. But I don't want to go on about that for three paragraphs. I've actually learned something over this hiatus, and I want to share that with you. Getting my inbox to empty everyday is also starting to take it's toll on me. And the number of unread books on my bookshelf just keeps increasing. Keeping up with Facebook hasn't gotten to me yet, but it's probably just a matter of time. I can't keep up! Twitter is the latest social phenomenon, and I feel that its lack of queuing has been an important part of its success. It's very easy to keep up with Twitter, and that is something that everybody is yearning for nowadays. Limit the amount of time you check email. You can even have set times during the day. If you are reading something, and you're not enjoying it, put it away and move on to the next thing. Reading for personal development shouldn't be a chore. Sadly, I don't have much more than that. What are some things that you've done to eliminate or manage your input queues? Posted by Zakir Hemraj at 10:20 p.m. If it's not your job to know it, it's ok to not know about it. Limit browsing/rss to one session per day! AND if you get interrupted, too bad. Your session is over. Limit tv to one show or movie a day, with none every other day. Read instead (in depth content, not fluff). BUT most importantly, take time to do nothing. Sit quietly. Clear your mind. Doing this daily makes a huuuuge difference! Great suggestions Derek! I hope all is well. I have a problem of letting queues build up as well. I find the suggestions in your post and from your commenters valuable. I don't have any other suggestions except to maybe more picky about what you choose to read/listen/watch etc. I know I definitely should be! I only worry about my work email Inbox and I make sure that it stays at empty. I tried keeping my personal email empty but it fills up way faster with junk. So I keep 99 emails in my personal email unread because it reminds me of the Jay-Z song 99 problems. I don't limit checking email, or my reader as I am too curious and I like it when I get new emails. For the most part I just deal with the excess. And in Google Reader if I've had enough of it, I just mark all as read. As to how to manage it all, I just don't worry about it and live how I've always lived. Now why you don't read newspapers is rather interesting? Zaid has an interesting point about newspapers. They ARE aggregators. Is there a business model for a site that pretends to be a newspaper? "All the most popular I.T. & World News items of the week, published at 5pm every Friday"
What I *really* need to do is stop bookmarking things. It creates so much mental clutter, and really, it's always on Google if I need it. 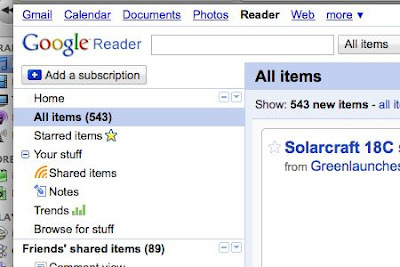 I have a lingering pre-Google packrat mentality. I also like Farhan's suggestions. My PVR is gone, too. I download whatever I want to watch, and watch it at my convenience. I read news.ycombinator.com - which dosn't have a search, so once it's off the front page, it's pretty much gone. I didn't have voicemail for years, becuase I didn't answer it. When I got my iPhone I thought visual voicemail would change that, but it hasn't. I *should* change my message to "i'm not going to listen to this, please email or text me"
i very much enjoy your posting type, very interesting. don't quit and keep penning mainly because it just simply that is worth to read it. left my hair shiny and smooth. Extra long plates cut my routine in half... I refer this product to everyone!!! of an eye. The best part is that it "STAYS" silky and straight until the next time I need to wash and straighten. No gimmic here. I highly recommend them over chi and fhi.